We examined the performance of active U.S. equity funds in "down" and "up" markets during the two-decade period ended Jan. 31, 2018. 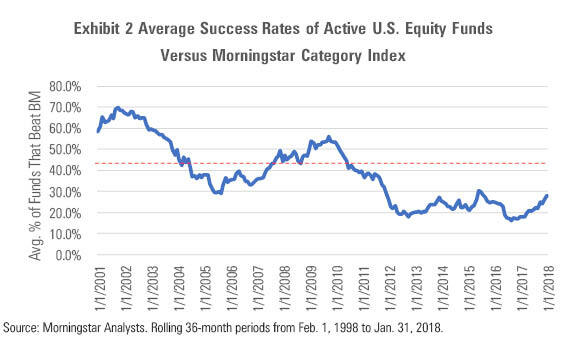 We found active U.S. stock funds succeeded nearly twice as often in down 36-month periods than up periods; this trend held across all nine major U.S. stock Morningstar Categories. Active U.S. stock funds that succeeded in down periods outperformed by larger margins, on average, than funds that beat their benchmarks in up periods. Up periods far outnumbered down periods during the two-decade span. Outperformance was fleeting: Most active U.S. stock funds that beat in one period lagged in the next nonoverlapping period, especially when they beat in a down period. All told, the findings support the assertion that active U.S. equity funds succeed more often in down markets, but the data do not bolster the overall case for active funds. To hear their defenders tell it, when the going gets tough, actively managed equity funds get going. Their thinking goes something like this: The stock indexes must own everything whether it's crummy, overvalued, or otherwise. That works like a charm when stocks are rising. But it's trouble when markets are down and investors lose their nerve. It's then, they argue, that active management proves its mettle. And how? By owning stocks outside the index, deviating from the index's weightings, and hoarding cash. If those defenders have been a bit more full-throated lately, it's with some reason: Active U.S. stock funds fared relatively well in the recent market correction. As shown below, nearly 60% of unique active U.S. stock funds beat their indexes during the late-January/early-February correction. That represents a reprieve for active U.S. stock funds, as they've been mired in a long slump. To illustrate, the chart below shows the percentage of active U.S. stock funds that beat their indexes, on average, in the rolling 36-month periods between Feb. 1, 1998, and Jan. 31, 2018. On average, more than half of active U.S. stock funds routinely failed to beat their indexes during these rolling 36-month periods. 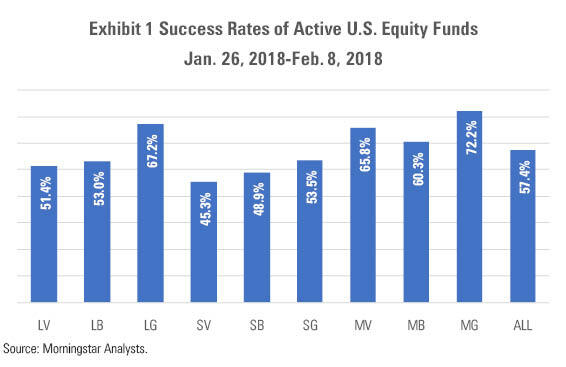 In addition, the success rate has declined over time: Only 28% of active U.S. equity funds beat their benchmarks in the three years ended Jan. 31, 2018, which is about 10 percentage points below the average of all rolling 36-month periods. That said, the U.S. stock market has been on a rising trajectory for much of that time. If active funds perform better in down markets, as their defenders maintain, then success rates could improve once markets sell off. But the fundamental question, which we explore further below, is whether the evidence supports the assertion that active stock funds make hay during downturns and, if so, what that might augur for investors considering active funds as a long-term investment. We examined the rolling 36-month net returns of all active U.S. equity funds that existed between Feb. 1, 1998, and Jan. 31, 2018, including dead funds. We compared these funds' net returns to the returns of the Morningstar Category index assigned to them as of the beginning of each rolling period (that assignment being based on the fund's category as of that starting date). 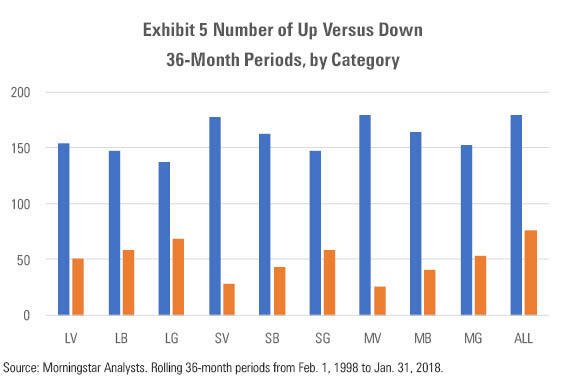 We defined a "down" period as any rolling 36-month period in which the category index had a negative return, and an "up" period as any in which the category index had a positive return. 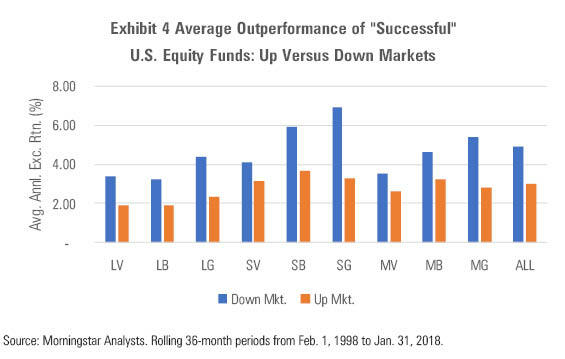 We found that active U.S. equity funds were indeed likelier to succeed in down periods than up periods during the 20-year span we examined. 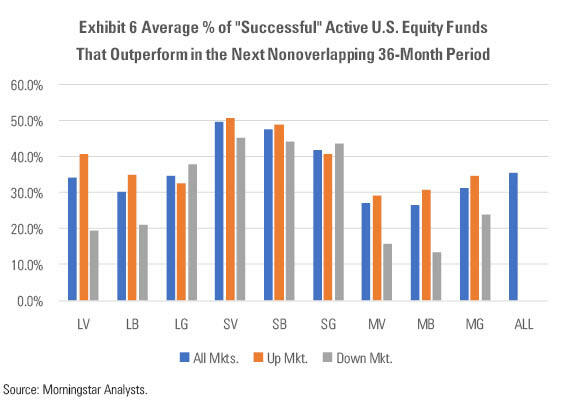 All told, nearly 60% of active U.S. equity funds outperformed their bogy in down periods, on average. By contrast, only about 32% of active U.S. stock funds beat their indexes in up periods, on average, meaning the odds of succeeding were almost twice as good when the market was down than when it was up. What's more, active U.S. stock funds that beat their benchmarks in a down period did so by a far wider margin than those that beat in an up period. In other words, success was more frequent and the payoff larger in down markets than up markets, on average. But there's a catch: There were far more up periods than down periods during the 20-year span we examined. Moreover, when active funds succeeded, they tended not to sustain their outperformance. Only about a third of successful funds went on to outperform in the next nonoverlapping 36-month period. Furthermore, "repeat" rates were generally lower among active U.S. equity funds that succeeded in down markets than those that outperformed in up markets. 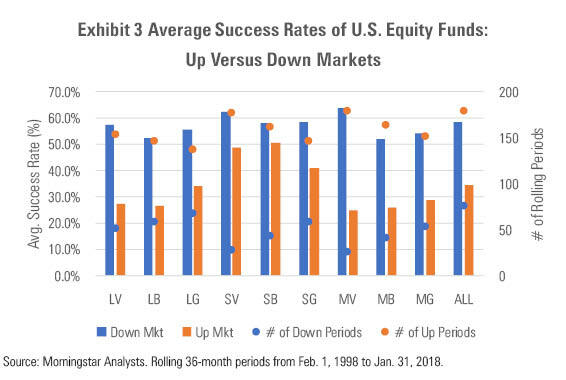 To summarize, while active U.S. equity funds succeeded more often in down periods than up periods, and by larger margins on average, those down periods came infrequently, and funds that outperformed at those times tended not to repeat in the future (in part because down periods were mostly followed by up periods). Consequently, active U.S. equity fund success rates have remained low. Defenders of active U.S. equity funds have been right...and wrong. Right in the sense that they appear be correct that active stock funds hold up better during down markets than their indexes. But wrong in that the outperformance hasn't translated to long-term success, as up markets have greatly outnumbered down markets and success has proved fleeting, especially among active funds that have beaten their bogies during down markets. Notwithstanding that, it is useful to note the way cyclical factors--such as whether a market has risen or fallen during a given 36-month period--can influence active-fund success. While critics of active management have seized on low success rates in arguing that active investing is largely futile, it's at least plausible that the rising market of recent years has created a headwind for active equity funds, depressing success rates. As market conditions evolve, we're likely to see active U.S. stock funds beat their benchmarks in greater numbers. While that will provide sustenance to those who defend active funds, it doesn't make the case for them outright. After all, markets tend to rise, not fall, in longer periods. Moreover, funds usually aren't able to sustain their outperformance for a variety of reasons, including asset bloat. Finally, fees are usually too tall a hurdle for most active funds to clear over the long term anyway. Better performance in down markets is not sufficient reason to choose active U.S. equity funds.